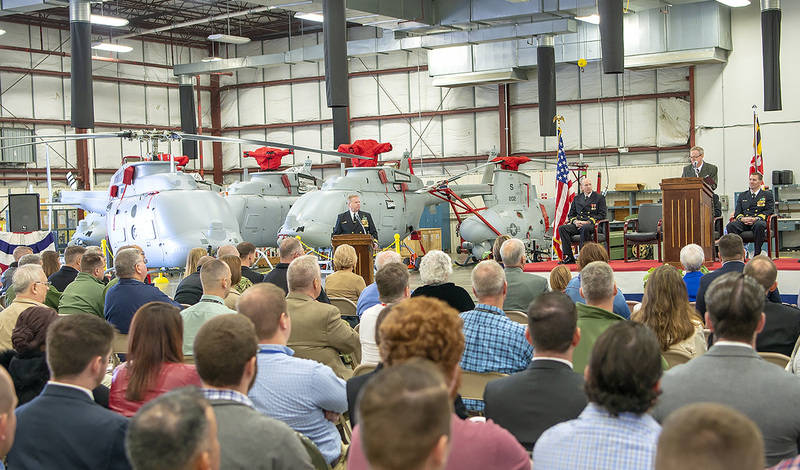 In a ceremony held on October 18, the U.S. Navy commissioned its first test squadron dedicated to unmanned air systems (UAS). The creation of a dedicated UAS trials squadron was approved by Chief of Naval Operations, Admiral John Richardson, in April this year. UX-24 joins three other aircraft-operating trials units within NAWCAD. VX-20 is the “Force Warfare” test unit, flying the Navy’s larger maritime patrol, airborne early warning and transport aircraft, such as the E-2 Hawkeye, P-8 Poseidon, and C-130 Hercules. It also tests the Northrop Grumman MQ-4C Triton large UAS, as this aircraft is closely related to the P-8 in its operations. HX-21 tests rotary-wing and tiltrotor aircraft, while VX-23 is the tactical aircraft test unit, its roster including F-35Bs and F-35Cs. NAWCAD also parents the U.S. Naval Test Pilot School. NAWCAD’s new UAS squadron is based at Webster Outlying Field (WOLF), part of the center’s Patuxent River complex in southern Maryland. The squadron operates more than 23 UASs of various sizes and capabilities, including the Northrop Grumman MQ-8 Fire Scout, Boeing/Insitu RQ-21 Blackjack, Aeronautics RQ-26 Aerostar, and the RQ-11 Raven, RQ-12 Wasp and RQ-20 Puma from AeroVironment. A number of commercial UAS types are also employed. UX-24’s task is to provide platforms, operators, maintenance, safety oversight and facilities for RDTE&E (research, development, test, evaluation, and experimentation) activities associated with UASs for both Navy and Marine Corps. The “WOLF” facility has two 5,000-ft runways with direct access into restricted airspace, requiring no co-ordination with FAA air traffic control. A dedicated area for small UASs is available, while the base is close to water for maritime operations. UX-24 holds a blanket interim flight clearance for all government-supplied UASs operated by the unit. One of the squadron’s most important current projects is the Fire Scout, with both the earlier Schweizer 333-based MQ-8B and larger Bell 407-based MQ-8C on charge. In July, the MQ-8C completed IOT&E (initial operational test and evaluation) with a flight test campaign aboard the USS Coronado conducted by VX-1, the Navy’s aircraft operational evaluation unit, which is also based at Patuxent River.